When I was young, my mother purchased a collection of classic Western children’s books translated into Japanese from an uncle who was not having much success at selling them door to door. I was captivated by stories such as Louisa de la Rame’s “A Dog of Flanders”, Hans Christian Andersen’s “The Little Match Girl”, and Oscar Wilde’s tale of the “Happy Prince”. I often re-imagined these books with happier endings or conjured up new characters and new plots. Dog hook by Muranaka Yasuhiko. It is cast using the lost-wax casting method. I was reminded of the happy memories of these captivating stories and the animal characters that appeared in them when I discovered the metalwork of Muranaka Yasuhiko at a craft fair in Japan last year. Muranaka-san had an array of animals on display that were light-hearted in their appearance and that exquisitely captured their essence. His animals all looked as if they had stories to tell, perhaps along the lines of my childhood fantasies. Very few metalwork artists show their work at craft fairs in Japan, so I was delighted to come across Muranaka-san. He is a rare artist who has the skill and expertise not only to make the small pieces that I saw but also to create large sculptural metal installations. His work has won numerous prizes and some have been shown at the Japan Fine Arts Exhibition (Nitten) and the highly respected UBE Biennale International Open Sculpture Competition. When I asked Muranaka-san why he made both small and large pieces, he explained that his approach was to regularly alternate between working on large and small pieces. Keeping this rhythm allows him to “create new work with vigor” because he enjoys creating small work just as much as making large installations. Muranaka-san’s love of metal began when he saw molten steel at school for the first time almost 40 years ago. He was mesmerized by the beauty of its color. “It was so beautiful and so I decided to major in metal casting”, he said. But his career as a metalworker did not begin immediately after graduating with a Masters’ degree in metal casting from Tokyo University of the Arts. He initially took on a job at a home economics department in a woman’s university. “My regular job was not in my area of study, so I continued to create work in my spare time by belonging to a craft group”, he said. 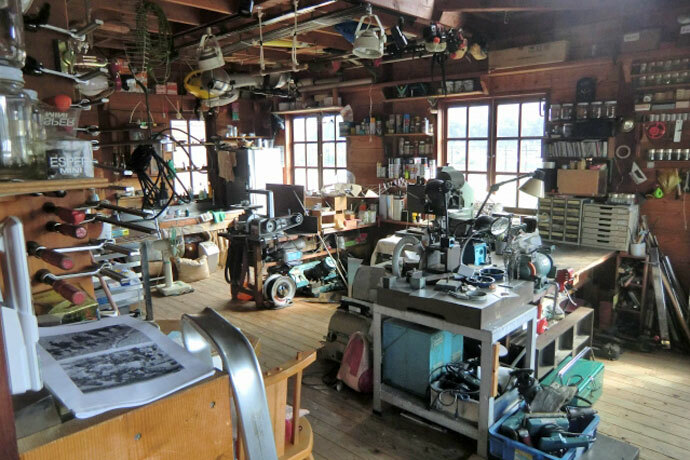 “There were people in the group who were working full-time as metalworkers and they finally inspired me to become a full-time maker, just a couple of years before I turned 40” he reflected. “When I switched to making art full-time, the joy of completing a project or when someone purchased my work intensified. I enjoy the challenge of being able to decide how to make my work and to introduce them into the world,” he said like a proud father. Muranaka-san’s stainless steel hooks are made using the lost-wax casting method, in which a metal form duplicate is created by casting the original sculpture. “In lost-wax casting, even the fingerprints on the original sculpture can show in the duplicate form, so it is a very intricate process. But the detail must be balanced with the form because delicate details next to a mass of metal do not cast well.” He explained. “When I create the original sculpture, I always think about the suitability of the form for casting. It is difficult to explain in words, but I feel that there are shapes that are more fit to cast,” he added. 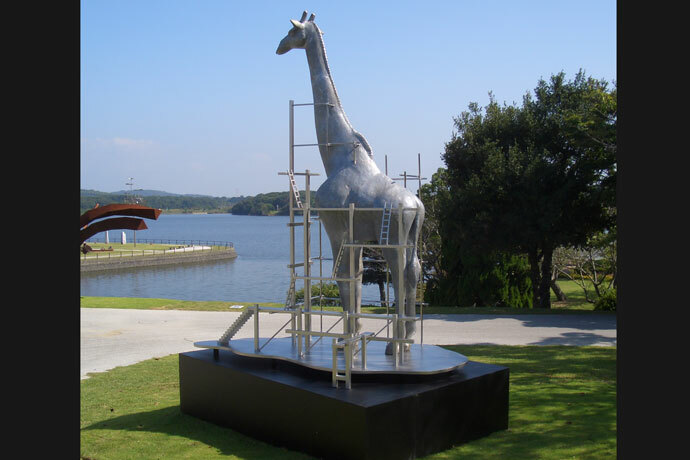 The animal motif works are only a part of the wide range of works that Muranaka-san creates in his two studios in Hiroshima and Yamaguchi prefectures. 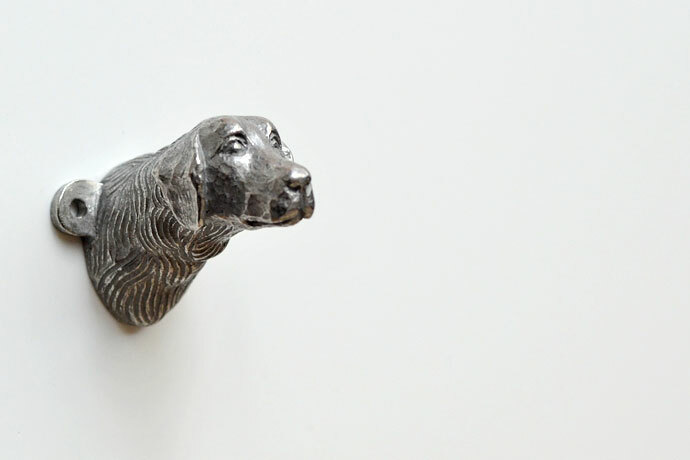 However, he feels that his animal works are the most interesting for smaller utensils like hooks that are used inside the home. 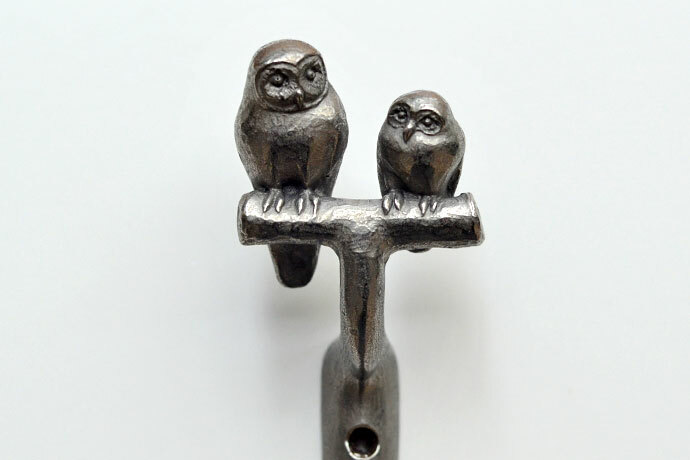 Studio KotoKoto is happy to be able to bring these adorable hooks by Muranaka-san to our customers in the U.S. There maybe one or two in the collection that can bring back memories of your favorite childhood book animal characters. Yokotsuka Yutaka grew up hearing the sound of furnaces and mingling with the foundrymen working at his grandfather’s factory in Komatsugawa on the eastern edges of Tokyo. “I naturally thought that I’d grow up, graduate from school, and succeed my family business. I had no doubts,” he says in looking back at his life. After over 40 years spent at the foundry, this quiet and unpresuming maker now dedicates his time to the making of Japanese water kettles or tetsubin using age-old traditional methods. Tokyo Tetsubin by Yokotsuka Yutaka. This pattern on the kettle is called arare, which means hailstone, and originates from the motif on cast iron pots traditionally used in tea ceremony. Tetsubin is a Japanese cast iron kettle used for boiling water. 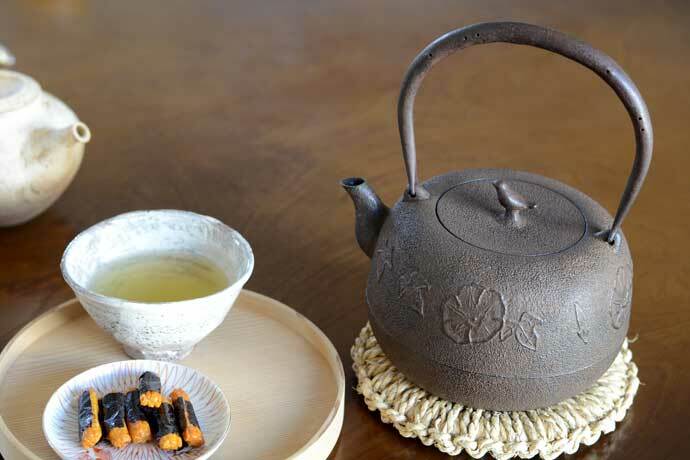 It became a popular household utensil during the late Edo period in the 18th century when leaf tea or sencha became available for mass consumption. Although many similar utensils for boiling water with spouts and handles are found around the world, surprisingly water kettles made of cast iron were historically only made in Japan. The California Academy of Sciences has studied the tetsubin and although it says that the exact origins of the tetsubin are unclear, its genesis may stem from the widely held belief among tea enthusiasts that water boiled in an iron kettle tastes better than water boiled in any other material. A typical cast iron pot used in tea ceremonies. Hot water is scooped out with a bamboo ladle. In formal tea ceremonies, the water is boiled in a cast iron pot without the spout and is scooped out with a bamboo ladle. 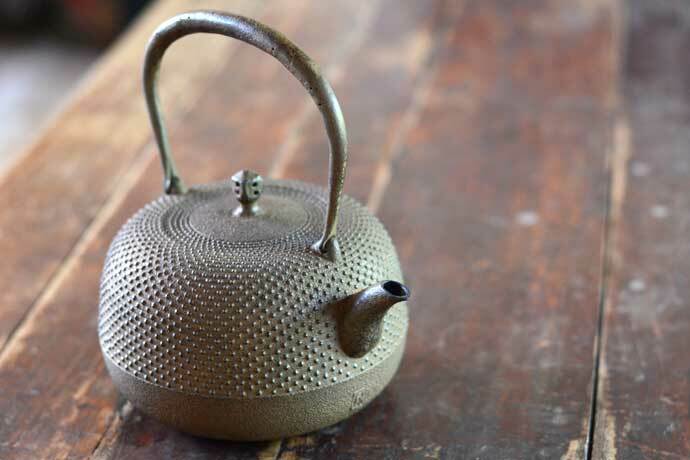 Many practitioners of formal tea agree that the water boiled in cast iron makes the best tasting tea. While I will leave it to the scientists to provide the scientific rationale as to why this may be the case, the tetsubin, the smaller, portable and more convenient utensil for boiling water for tea, quickly became the affordable luxury for people in the late Edo period. 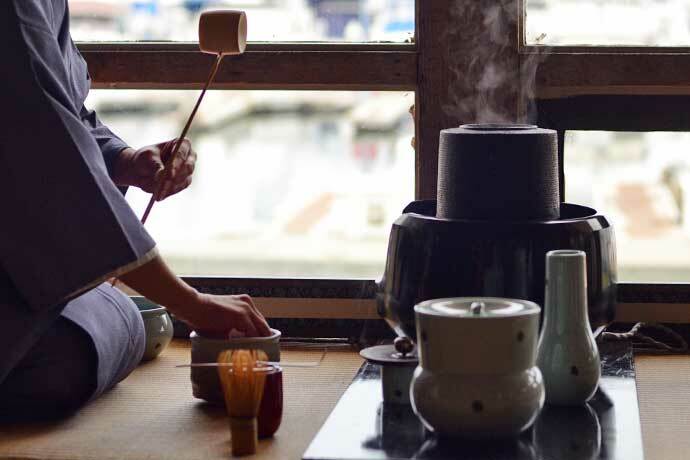 Tetsubin on top of burning charcoal heaters or hibachi became very fashionable to share tea and keep warm with family and friends, even if it was for the purpose of making cheaper and more common leaf tea. Tokyo Tetsubin by Yokotsuka Yutaka with morning glory motif. Morning glory (or asagao) became adored by the common people of Edo and is regarded as a symbol of old Tokyo culture. The production of tetsubin peaked in the early 20th century when they were made in foundries all over Japan. But as national development turned towards militarization in the 1930s, the supply of iron for non-military needs became tight. Concurrently, as charcoal heating of the homes was replaced by kerosene, gas and electricity, the demand for tetsubin steadily dropped. 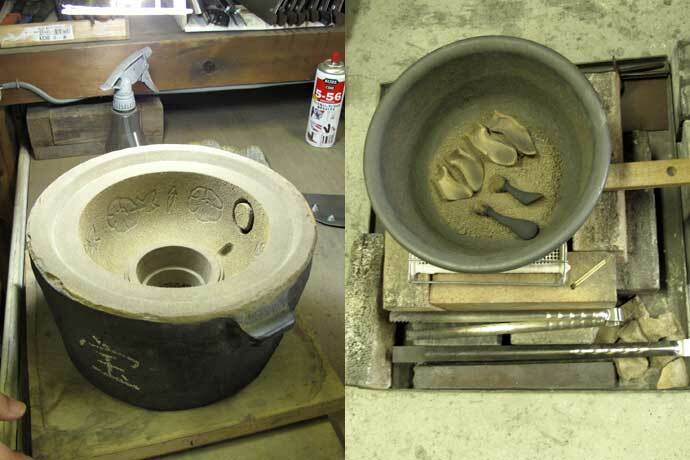 Nowadays tetsubin making is mostly carried out in Iwate, which is where most ironware is produced in Japan. A good quality tetsubin is light-weight with crisp motifs and unobtrusive exterior. They also have well-balanced spouts that pour water without dribbling. Its handle is hollow and forged from a sheet of iron which stays cool even when the kettle is heated. Apart from the handle forged by a fellow metal smith, Yokotsuka-san makes the rest of the kettle himself. Yokotsuka Yutaka demonstrates how the inside of the exterior mold is prepared. Each nub of the hailstone kettle is created with a tool by hand. Molds for the exterior of tetsubin and spout. Each exterior mold is only used once to create crisp patterns. 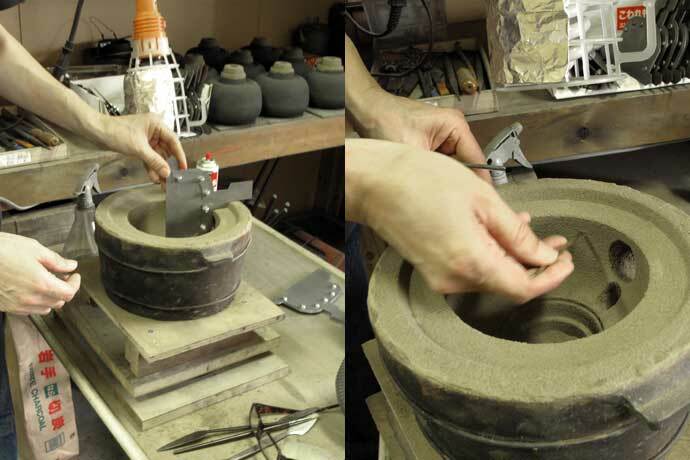 Traditional tetsubin-making involves four separate molds. There are two molds for the exterior and interior of the body, a mold for the spout, and a mold for the lid and its knob. Yokotsuka-san only uses the external mold once because re-using the mold, which is made from sand, makes the design of the kettle less crisp. 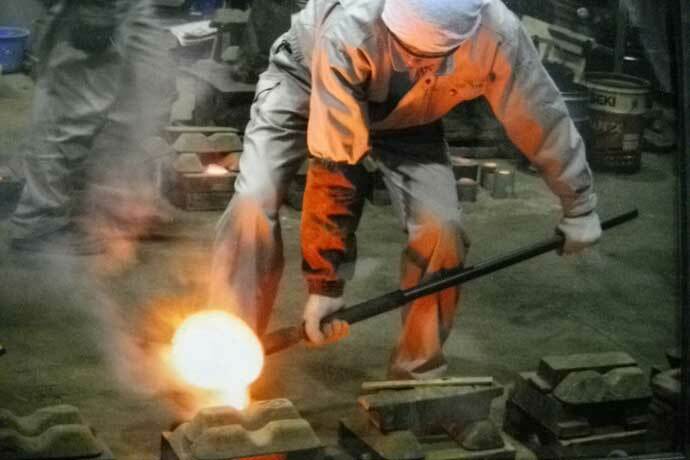 The pouring of molten iron is the most difficult part of the tetsubin-making process. The temperature of the iron and the speed of pouring all affect the end result. Yokotsuka-san admits that because the wall of the tetsubin is so thin, mistakes are not rare. After they are cast, each tetsubin is baked in charcoal. This is a traditional method to reduce the initial rusting of the interior until a mineral layer is formed through repeated use. The exterior is coated with an iron mordant base and urushi lacquer. 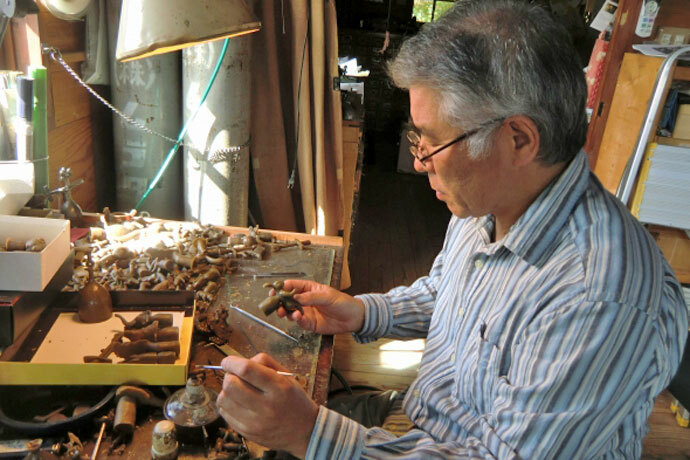 Yokotuska-san is as firm and iron-willed as his creations in maintaining the legacy of tetsubin-making in Tokyo. “The foundries closed in Tokyo, and casting work of crafts became moribund in Japan. So I feel a great purpose in making tetsubin using the traditional techniques here in Tokyo”, Yokotsuka-san explains. He hopes to keep the fires of Tokyo’s forgotten foundry history burning, and dreams that one day he will be able to pass the knowledge on to the next generation.